Thanks for a great tour and wonderful company. I am hooked on Cycling Escapes. Can't wait for the next adventure. One of the best, most scenic adventures of my life! That was a really fabulous trip, and I miss it already. You and Adam did a fantastic job keeping us all safe, happy, well-fed and inspired. Truly an epic ride. The organization and support were the best! Thanks Rich - what an awesome time - goes on my best vacations ever list. What a great tour! Soooo very much more for me than a vacation! A life changing event. The Cycling Escapes Utah 5 Parks tour was one of the best vacation experiences I've had in my life. Rich's first-class attention to details with planning comfortable accomodations, delicious meals, detailed maps, over-the-top SAG support allowed us all to focus on cycling worry-free; truly enjoying the epic Utah parks scenery, and great companionship. Thanks for another perfectly executed and wondrful trip. Everything was Epic! Thanks for an amzing adventure. The ride was mind opening and I'll never forget it. I've ridden 2 tours with Cycling Escapes. Great rides, great support, and met great people to ride with. Another great great trip. And you make it the best. I'll be back!!!! I can't imagine a cycling trip anywhere that beats this trip. This is the kind of trip where you think you have just had the best day of cycling ever, and then the next day comes along and THAT turns out to be the best day of cycling ever! Every day is awe inspiring for it's beauty, ruggedness, and remoteness. Absolute highlights were the Grand Staircase Escalante, the ride to Capital Reef, and then there was the Burr Trail - possibly one of the most incredible rides in the world. Did I mention the hike down Bryce Canyon? This is a 'must do' trip. I have done 8 trips with Cycling Escapes.Two of those trips were riding a tandem with my spouse. If you like lots of miles through beautiful places, considerable climbing, great ride support, very nice accomodations and meals, you will not be disappointed. Michael and I had SUCH a great time on your tour. You were as steady as a rock! Always there, efficient, dedicated to seeing that your guests were cared for and had a good time. You are clearly committed and dedicated and passionate about what you provide for people like us who are fortunate enough to have experienced the trip you put together. Some tour groups say the words; you saw to it that no one was disappointed. I just can't say enough good about the whole experience. Amy and I thoroughly enjoyed spending such a wonderful week with this group of amazing people. We will long remember you all and the fun times we had with you. Thanks for the memories! Thanks for a great trip. Working on friends to go on another epic cycling escapes next year. Thanks for the trip of a lifetime! Last week was the best - the scenery, new friends made & riding a bike......how can it get any better?!! . I want to take a minute to express my sincere grattitude for another great trip. Cycling Escapes is EXACTLY what I want in a trip - great, well designed rides in exciting locales. We rode with Cycling Escapes on the Utah 5 Parks tour in 2011. Definitely the best bicycle tour we have ever taken. Challenging routes and great support made it a tremendous experience. We booked a tour for 2012 immediately after. I was impressed with your level of organization and the degree of support provided. Certain features, such as the hand wipes and the convenient selection of snack foods in the trailer shelves are great ideas that I have never encountered before at any price level. I really liked the ride back to Escalante. Loved being up on that hogback ridge again, always enjoy riding down something I came up and wondering how I ever got up it. The long climbs were tiring, but not impossible. Waking up this morning, still with a smile on my face from this past week's experience, I jumped on your website to find my next challenge. You are scarily efficient. You also are a terrific tour guide etc... I know you probably get tired of people telling you how great your company is, but I am so impressed at what you have done that I feel compelled to tell you yet again. You truly have made a big impact on the entire groups lives. Thanks for an amazing cycling adventure! Where else but in southern Utah can you create a bicycle tour through 5 National Parks and Scenic Byways in 8 days! Starting in Zion National Park in southern Utah, on this spring and fall cycling vacation we'll bike from Zion National Park to the red rock hoodoos of Bryce National Park, then onward to Grand Staircase Escalante National Monument, Capitol Reef National Park, Lake Powell and the little known Burr Trail. For this 2019 cycling tour we meet in Springdale, Utah, gateway to Zion National Park. We suggest you Fly into Las Vegas or St George on Saturday, so you will be ready to go Sunday morning when our shuttle picks you up at 8:00am at a local hotel in St George, Utah. 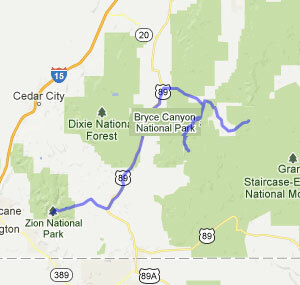 It is a 45 minute drive to Zion Park. If you are driving you can meet us at the first night's Hotel and leave your car there for the week. After arriving at our hotel for the first night, the La Quinta Zion Park, just outside Zion National Park, we'll have a brief orientation, set up bikes and still have time for a short 23 mile bike ride down Zion Canyon Scenic Drive. Dinner is on your own with lots of choices within walking distance. Today marks the biggest climbing day of the tour. We start by cycling through Zion National Park up a series of switchbacks with amazing views to the Zion Mount Carmel tunnel, where we'll shuttle through to the east entrance. This begins a beautiful bike ride through the upper east portion of the park, where we'll pass geological wonders such as Checkerboard Mesa. Don't forget your camera! After biking Zion National Park we cycle north, meandering through sleepy towns and eventually meeting Scenic Byway 12. Cycling through the red rocks of Red Canyon on a gently sloping bike path, we'll cycle toward Bryce National Park and it's historic lodge, our hotel for the evening. Take a stroll to the Park rim and watch the patterns of light flow across the Hoodoos in the setting sun! We spend the next two nights at Bryce National Park. Our second day in Bryce National Park we bike along the Bryce Canyon Scenic Rim Drive, where we top out at over 9,000' at Rainbow Point. Stop at all the pullouts along the way for views into the canyon and its famous hoodoos. If you prefer a long hike after yesterday's epic ride now is your chance. Today we start the morning with a short 90 minute hike into the Hoodoos of Bryce Canyon. It's a must see and a good warmup before we get on the bike. We then cycle into the Grand Staircase Escalante National Monument on our way to Escalante. Make sure to stop at Escalante Outfitters & Coffee House to relax on the porch sipping your favorite post ride beverage. Today we climb! The highlight of today's bike ride is a 14 mile, 4,000 foot ascent straight up Boulder Mountain. Continuing along Scenic Byway 12, we'll bike through forests of fir, giving way to aspen, as we climb toward the 9,600' summit. Here we are rewarded with fantastic views of the Grand Staircase from above, and a 10 mile descent on the other side! But first we have to scale the canyon wall of Hells Backbone, a canyon road like no other. Prepare to be amazed! Riders always name today's route as one of their most scenic rides on a bike. We leave Escalante cycling on Scenic Byway 12 toward Capitol Reef National Monument and it's amazing Canyon Country. This is one of Utah's most scenic rides, with panoramas of vast slickrock and scenic canyons cut by the Escalante River. We spend the next 2 nights at the Broken Spur Inn, so unpack your luggage and enjoy the epic views. Welcome to some of the darkest and most beautiul night skies in the United States! Capitol Reef National Park is a hidden treasure filled with cliffs, canyons, domes and bridges. It is an undiscovered gem. The Waterpocket Fold defines the Park. it is a nearly 100-mile long warp in the Earth's crust. Bike into Capitol Reef through a canyon of geological wonder with it's white domes of Navajo Sandstone and cliff layers visible back to the Permian and Cretaceous periods. Today we cycle through these timeless reefs along the National Park's Scenic Byway. After the ride, we take an optional hike to a free standing Arch on the slickrock domes of the Park. We'll also view a 1,000 year old wall of petroglyphs left behind by the Anasazi Indians. Rest up, because tomorrow is an Epic day. Today's 112 mile bike ride marks the longest ride of the tour. But don't worry, the first 35 miles is a gradual downhill. We start by cycling through the incredible narrow canyons of Capitol Reef National Park on our way out into the vast expanse of Canyon Country. After a brief ride through the badlands between the park and Hanksville, we'll cast out into 100 mile vistas along the Trail of the Ancients Scenic Byway. We then cycle through red rock country, on our way to Lake Powell National Rec Area which borders Utah and Arizona. We'll be staying at Defiance House Lodge, which overlooks spectacular Lake Powell, arguably the most unique lake in the world. Today we will be cycling the Burr Trail, a serpentine road that snakes through sheer canyon walls as it slowly climbs from Lake Powell up to Scenic Byway 12. Along the way there are fantastic views of the Waterpocket Fold, Boulder Mountain, Capitol Reef, and a gripping ride up the switchbacks of Burr Canyon. You have an option today. Those feeling strong after the long ride yesterday may start out from Lake Powell for a 55 mile ride. 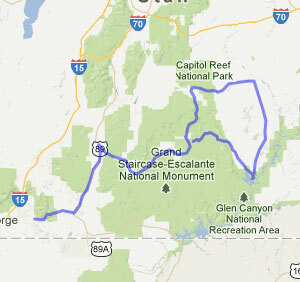 Those a little leg weary may shuttle to the far boundary of Capitol Reef for a 35 mile ride into Boulder. Either way, both rides require a short, very scenic shuttle over a 16 mile section of dirt road. The ride through Long Canyon will leave you breathless. After cycling the Burr Trail, you have the option to continue riding another 28 miles through the Canyonlands to Escalante where we will return to the Canyon Country Lodge for our last night. You just completed an Epic 5 National Park Tour! Enjoy a celebratory dinner at the Lodge, or wander into town for coffee and pizza at Escalante Outfitters or a micro brew at the local Brewery. Monday morning we shuttle back to Springdale and Zion Park, and then on to St George, where you may stay overnight or catch a shuttle back to Las Vegas with St. George Shuttle.